This week has obviously been a week of preparing and gearing up for Christmas or Weihnachtstag. We have been anxiously awaiting some packages from the States from the Grandparents...as of Wednesday, still not here. Bryn decided instead of taking naps this week she was more into playing in my bathroom with my eye liner and the toilet paper. Whew, that is fun. 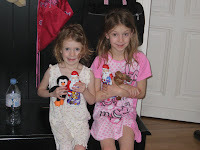 Thursday and Friday the girls received a "Christmas Miracle," that is what they called it anyway. Everyone told us here not to get our hopes up for snow at Christmas time. It has something to do with the Rhein River effect. But, we had quite a dusting of snow, so Bailey went right out and made snow angels in the snow and made a 2-dimensional snowman out of rocks. We finally received 2 of the four packages we were waiting for on Friday afternoon at 4:30pm. We were grateful as one of the most crucial packages arrived in time. We have started receiving some friends' Christmas Cards and are flattered that you would send them all the way here. We are so excited to get them, so thanks to whoever has sent one. 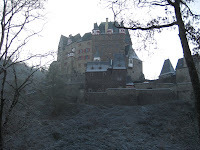 We went to Burg Eltz castle when it snowed. It is really amazing especially with snow. Unfortunately it was closed but we felt like we still got something out of the experience of seeing it covered with snow, and being the only people there. Sunday, we had the pleasure of having some friends from Church over to our house for cookies and hot chocolate. 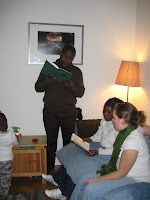 One family just moved here from Sierra Leone - what incredibly interesting stories they have about their country. The other family has become our regular holiday get together friends as we have been together for 4th of July, Thanksgiving, and now pre-Christmas Eve. 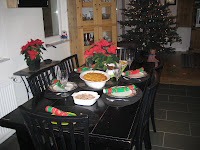 We were not sure about what to do for Christmas Eve Dinner this year. Usually we go to Greg's parents that night. We decided to have Christmas goose. We didn't want to go with turkey again. It was great. We had a nice family dinner, did our annual Christmas pageant but used the Little People nativity this year because we didn't have enough people to do all of the parts and there was a bit of a disagreement about who should play Mary. I don't think I will post the video as it is a bit of a disaster. Apparently Avery, who was assigned to play the Wise men, was not leading them in the correct direction. And, Bryn just wanted to steal baby Jesus and run off with him. I have faith that Heavenly Father knows we had the best of intentions and some of the spirituality of trying to celebrate what is really important has gotten through to them. Christmas Eve was a late night for Greg and I but Christmas morning was great. We lost our internet access on Christmas Eve due to an outside line problem. That put a bit of a damper on the holiday because we had to cancel the video conferences we had planned with family and friends. It is amazing how attached we have become to the technology resources we have here. 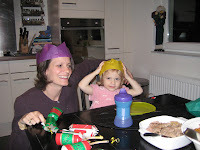 Here they celebrate Heilig Abend (Christmas Eve), Erste Weihnachtstag (1st Christmas), and Zweiter Weihnachtstag (second Christmas). It was really nice to have that extra day with nothing open to just relax and spend with family. My mother, sister and her family, arrived on the afternoon of the 28th. 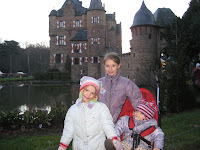 We took a walk down town Bad Godesberg and had some easy things for dinner. The kids were very excited to see each other. 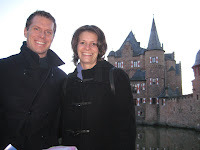 Saturday, we took the train to Köln where we visited the Dom and the Chocolate Museum. 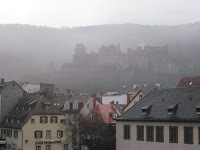 Sunday, we left for Heidelberg which has a very cool castle overlooking the city and it is a fun University town. The German version of Ann Arbor, with just slightly older history. We stayed the night in a very quaint hotel called the Holländer Hof. 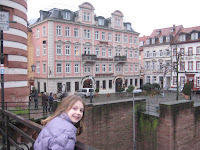 It was in a perfect location right in front of the famous Heidelberg Gate and Bridge. Heidelberg Castle in the distance. The next day we took off early for Dinkelsbühl and Rothenburg, which has the most famous Käthe Wohlfahrt Christmas store. Really cute towns and they get more snow than we do in Bonn. We tried some schneeballen which we are not sure if it was a New Years Eve thing or just a town thing. But, they were tasty. We had a slight separation from my sister and her family but found each other in the end which worked out well. We drove home which took about three hours and had raclette for dinner. We put the kids to bed because they were so tired, but the adults managed to stay up until Midnight. We were watching the movie, "The Holiday," when all of a sudden we started seeing some fireworks outside. Pretty soon, when midnight struck, everyone was lighting some of the most amazing fireworks. Everyone from our neighborhood were standing outside in the street lighting fireworks all around our house. I mean everyone. It was amazing, we had to run to the windows and see. Then, we felt compelled to go outside and watch them. My niece and nephew woke up and were enthralled with the fireworks display. What we thought was going to be an average New Year's Eve turned out to be something spectacular. Monday was usual as we were all tired and did not want to get up in the morning. We stayed up pretty late the night before decorating the tree. Monday mornings I usually spend the morning trying to get the house back in order and put all the folded laundry away. Monday afternoons I have my German lesson and this one was no different than any other Monday. That evening, one of Greg’s friends from work, who was visiting from the US, had dinner with us. It was very nice to visit with him. Tuesday morning was both the Toddler Group Christmas Party and Avery’s Kindergarten Christmas Program, at the same time of course. We dropped Bailey off at class, staked out some seats, took Avery to class and went back to the “Hall,” (that’s what they call their multi purpose room) for the performance. We went back and got Bay out of class to watch Avery. She was also helping with Bryn while I was trying to video tape the performance. I was very impressed. We raced from the performance downstairs for Bryn’s toddler group party where we were just in time to see Santa and get a present from him. It was really nice to visit with all the toddler group moms and dads especially since some of them will be heading back to work in January and I will not get to see them as regularly anymore. We picked Avery up from school and went home. We picked Bailey up and had frozen pizza for dinner. Greg had a work get-together to go to so we took advantage of the easiest dinner possible. Turned out to be frozen pizza. Wednesday morning while dropping the girls off at school, one of the moms in Bailey’s class came up to me and said that her son had made a gift for Bailey but he chickened out at the last minute and was afraid to give it to her. She also invited Bailey over for a play date. I said that I would talk to Bailey about it and see how she feels about it. That day after school, Bailey had girl scouts and they were caroling at a Senior center so someone dropped her off at 5:00pm or so. I gave her the gift and she thought it was so cool. She was thrilled about the prospect of having a play date with Maxim. Wednesday night is also homework night so it was a busy evening. Wednesday was also the night we were able to put aside our creative differences and create a Happy Birthday message to Evan after many, many attempts. Thursday was to be the play date which was significant because apparently if you are having a play date with a boy, you cannot wear a skirt or a jumper to school. You have to wear pants that you can play fuβball (soccer) in. 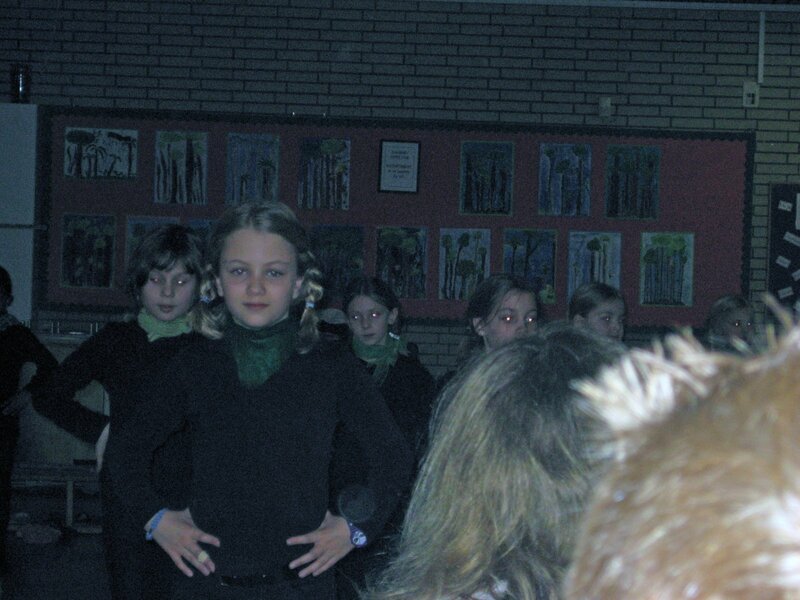 Unfortunately Bailey had already worn all of her school pants that week. What a dilemma. It took us so long to get ready that morning, we were running quite late. We agreed that she could wear some active pants because it was so important that she dress the part. All went well and the play date was a huge success. They played fuβball and after that they played Monopoly and had hot chocolate. 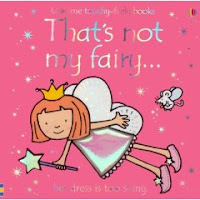 Avery also had a very successful day at school where she took a book to school called, “That’s Not My Fairy,” and read it aloud to her class. I highly recommend the book. It is very cute. I had to bake some cookies and make sandwiches for Avery’s Christmas party so I had to cancel my German lesson. I can only bake when Bryn is asleep, otherwise it is the biggest disaster. We picked Bailey up from the play date and found out that Maxim’s mother lived in Ann Arbor when she was Bailey’s age and went to Eberwhite Elementary School. What a strange coincidence. We went home, made pasta for dinner and then Greg got them ready for bed while I went to Book club. The book this month was, “The Ladies No. 1 Detective Agency.” It was a quick and easy read. I liked that it painted a positive picture of Africa instead of most of the other books I've read. It was actually the first book I have read completely since moving here. All of the other book club books I didn’t quite finish before the get-together. It was a very nice evening with some women that are becoming really good friends of mine. I was happy to have an evening out by myself. Friday morning was Avery’s Christmas party, we had cut sandwiches out with circle and star cookie cutters and we made candy cane sugar cookies. I was up at 6:00am making frosting and frosting the cookies with white icing. Then, Avery wanted red stripes so we made stripes with red sugar. They turned out pretty cute. The party was a huge success. Avery loved it. Friday afternoon, Greg took a half day and we scheduled a babysitter to come at 4:00pm so we could go Christmas Shopping. It is so hard to do when you don’t have a parent or a neighbor to watch your kids for a couple hours to run out and grab a few things. Thanks to the moms and Renee for previous years when I took you for granted. We got a few things but I was hoping to capitalize on the fact that we had a babysitter and get everything done. Fortunately, we had some time to ourselves. Saturday, pancakes - american style since I was making them. Then, shopping, shopping, and more shopping. We ended up getting so much done. That is significant because I was getting pretty stressed. We accomplished so much that it cut my stress. Our Ward Christmas Party was at 4:00pm. It was nice but was difficult to understand. Sunday, we made it to Church on time amazingly enough. I had to conduct the music today in Relief Society. When you don't recognize the hymn by looking at it because it is in German and you haven't read music since Middle School Band, it was intimidating. It was 4/4 time. It was a blessing! It has been an interesting week. Monday was normal, trying to get the girls out the door for school on time can be challenging. However, Bryn and I were on a mission as soon as we dropped the girls off at school. We had to get a present for Bailey’s present exchange at the dance talent show. So that was our plan. Unfortunately we ran out of milk again that morning and we changed our minds and went to the grocery store instead. I was hoping to find a present there that we could use for the present exchange but alas there was nothing. Bryn and I instead had a morning of researching Christmas presents online. We picked Avery up from school as usual. 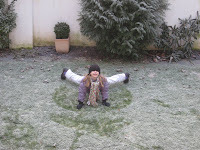 I had my German lesson in the afternoon and voila it was time to pick Bailey up from school already. It was leftover night. Yum. The girls love when it is leftover night because they don’t have to eat what I made. Tuesday was the talent show. Bryn and my mission continued when we dropped the girls off at school. 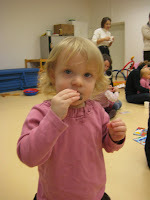 We attended the toddler group for a bit and then went to the Galleria downtown Bad-Godesberg. They have several shops that have a wide variety of things. We found some things. I think it is so hard to buy a present for someone you know nothing about, just a piece of paper with a name and an age on it. We also found some things for my girls as well. We wanted to take some of the Bad Godesberg Christmas Market in but it was pouring down rain and we left the umbrellas in the car – We are sooo American-Suburbia. We picked Avery up from school, and put Bryn to bed. Avery and I had lunch and played some games until I had to wrap the present and make sure the camcorder was charged for the much anticipated talent show. I got all of the cameras ready, we had to wake Bryn up when it was time to go. I really thought she would be a nightmare but they set up a small bench in front of us for the little ones to sit so they could see. Brilliant. She sat with Avery and the Leshs and she was remarkable during the performances. Bailey and Olivia were about the fourth to go. They did awesome. I know I am probably a little bias but if you had been to the first rehearsal when we couldn’t even agree on which step should go with which piece of music, you would know what I’m talking about. All-in-all, the dancers did a great job. 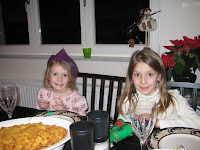 That night we decided to have breakfast food for dinner because it was late when we got home and that is what the girls wanted. I was going to make pancakes but the girls insisted on crêpes. Now I know why I usually make American style pancakes, they are so much easier. I told the girls from now on, dad makes crêpes, I make pancakes! Wednesday morning I was starting to get stressed about not having any presents purchased so Bryn and I were on a mission again. We dropped the girls off and headed downtown Bonn for some present shopping. We did great. We got a lot of things but Bryn was a bit of a handful in the toy store. We threw everything on the stroller and headed to the car with just enough time to run home, drop everything off, and pick Avery up at school. When I was unloading, I realized that I had purchased an incorrect present. I had heard horror stories about trying to return things in Germany (which my German teacher later said that is crazy). But, for the moment I was not feeling good about it. Later that afternoon, I decided to order some things online and I went through the whole purchase process waiting for the screen to pop up where you add your credit card information, and it never came. All of a sudden, I had placed an order where I didn’t know when it would be coming or how I was paying for it. I was slightly panicked about this, but I asked my German teacher about that too and he said it is not uncommon. I guess very often in Germany you place orders and they just send them to you along with the bill. Phew! I was glad to know I didn’t do something wrong. We will see how it all works out. 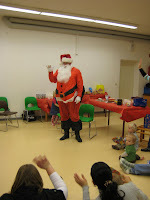 Thursday was St. Nikolaus Day. Wednesday night the girls had to leave their shoes outside the door and Thursday morning, the girls found some treats and small gifts in their shoes. Apparently if they have been bad, they get sticks in their shoes. It was fun to see their excitement when they found presents in their shoes. 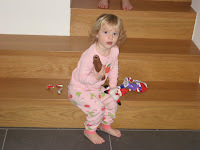 Bryn was not interested in the presents; she just wanted the chocolate as you can see. Since I really couldn’t stand to wait much longer to see if we could exchange the gift, once again, after dropping the girls off at school, Bryn and I went downtown Bonn. They were very nice and willing to exchange but they didn’t have the one I was supposed to get in stock and they weren’t sure if they would have it by Christmas if they ordered it for me. They told me this in German and I understood! That is some serious progress. I got something else instead. We’ll see how that goes over as well. Thursday night I made the Renee dinner, and most of the girls ate well. I think they ate much better when they were eating it at Renee’s house. After, we were all quite tired. We made popcorn and watched Home Alone together. Friday…a morning full of laundry and some Laufrad research on the internet. A laufrad is one of those walking bikes with no pedals. Everyone that has a toddler here has one and we were thinking that both Avery and Bryn need one. 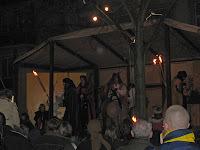 When Greg got home from work we decided to walk down to Bad Godesberg and see what the Weihnachtsmarkt there was like. It was okay. 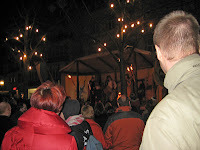 They had some live entertainment which was nice to listen to as we walked the markt. We went into the bike shop to try out some of the different Laufrads and tried to get Bryn to ride on the one she would fit. “No Way! No Way!” is what came out of her mouth. I honestly don’t know where she gets these things. Now they are her favorite two words. Saturday, it was back to Bonn in the morning. We had seen some cool things the first couple times we went and now we were ready to pick up a few things. We had some great food on the markt for lunch. I had a shish kebab looking thing that I don’t know what the name is. Greg had his usual…Bratwurst and brot. The girls had their usual…pomme frites (French fries). But, oh are they the best fries or what? We had only one issue and that was we lost one of Bryn’s shoes. Weird. We retraced our steps and everything. Gone. I have since asked my German teacher about a lost and found and he said there is one so we will have to check it out next time we are downtown. 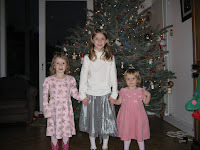 After the markt, we went to pick up our Christmas tree. Greg and I carried it into the house. It was truly a “Christmas Vacation” moment. I said that it looked kinda big in our house, and Greg retorted by saying that it isn’t big, it is just full. It is the first real tree of our married life. Greg and I strung the lights but we reserved the decorating until Sunday. After Church, we came home and grabbed a bite to eat. 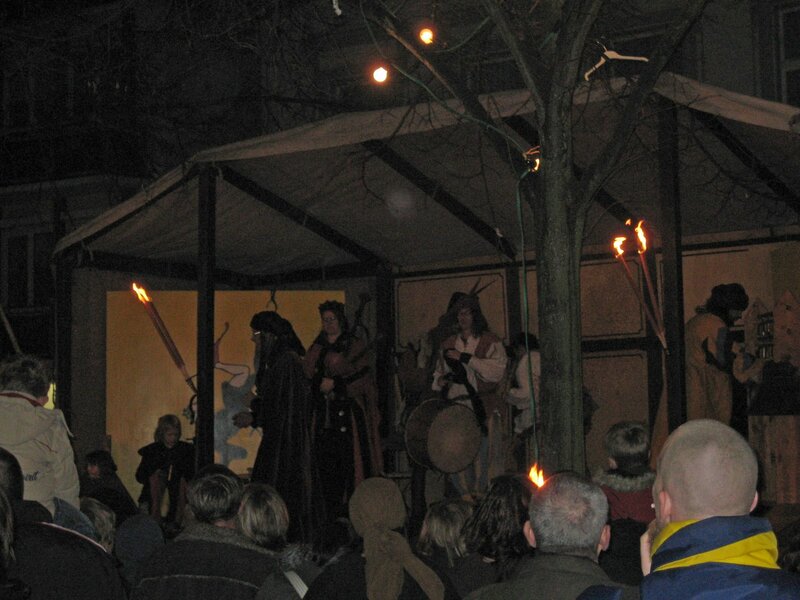 Then we headed to Burg Satzvey to see the Krippenspiele. They do a living nativity at this castle so we thought it was an appropriate Sunday late afternoon activity. You start with the Wise Men and follow a path through scenes from the night of Christ’s birth. It was wonderful. I’m sure the pictures I post will not do it justice. I’m really glad we went when we did. It was dusk and so by the time we ended at the stable with Mary, Joseph, and baby Jesus, (and the sheep trying to eat Avery’s coat) it was quite dark and they had torches lit along the path. On the way out, we saw St. Nikolaus and the girls wanted to say hi. What a very cool way to end the week. As it is officially Christmas time in Germany, it is quite the magical place. There are Christmas markets everywhere now, most of them started this weekend. This week was once again a busy one. I'm going to stop writing that, you can just assume that most of our weeks are busy. Let's see, Monday was a normal day. After school we had another dance rehearsal for the upcoming talent show. I think the dance is coming along quite nicely. Avery and Bryn were playing with Olivia's brother and sister while the girls were rehearsing. It worked out well. Bryn got sick that night. It was not pretty. But, she actually had a good nights sleep which was a blessing. Tuesday, Bryn was still looking a little pale in the morning and I was nervous about what the rest of the day was going to have in store. It was Bailey's dance recital after school and I didn't want to miss it. Bryn did fine throughout the day, so we were able to make the recital. You will probably have to enlarge the picture by clicking on it to see Bailey. I was quite impressed by the fact that they did six dances and have only been taking classes since September. After the recital, we had to hang out for a bit until my parent/teacher conference started with Bailey's teacher. She had nice things to say which is always good to hear. Then, the girls were so good during the conference that I told them we could go to McDonalds on the way home. We went through the drive-thru for the first time. My German teacher assured me I was ready. It was a disaster. She didn't understand a word I was saying so we had to pull around and order at the window. I said exactly the same thing and she understood that time. I later told my German teacher what I had said and he said my grammar was correct so I don't know what the problem was. We hurried home and ate our McDonalds, gather a portable DVD player and a movie together and headed for the Church. I had a RS Presidency meeting and Greg had a meeting there at 8:00pm. So, we planned on meeting there at 7:00pm. Greg and the girls watched a movie during my meeting and then we went home, and Greg stayed for his meeting. It was a long day. Wednesday seemed like it would be a day of rest, which I guess it was for the most part. 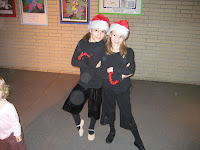 I was asked by the PTA to help out with the Christmas Market that they have at the girls school every year. They put me in charge of the Children's craft. So, part of my job was to do the advertising for the craft. I started to work on the sign. I was feeling pretty good about how much I got accomplished but was having some issues with the glue choices I had at home. Bailey had girl scouts after school and after we picked her up, I was quite tired. I made cheese tortellini for dinner which did not go over very big as Avery told me earlier that she wanted "taco bell" soft taco supremes. 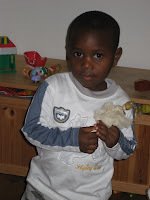 Thursday, I was planning on taking Bryn to Toddler group but she was still having some sickness issues. We had to stay for a bit in the morning to have a conference with Avery's teacher, again fairly good things. Bryn and I went home and she proceeded to build with the blocks while I made cookie dough. I put our rock hard butter into the mixer, and I added all the other ingredients (which I have done a million times before). When I began to mix it, the rest of the creamed ingredients flew out of the bowl all over me and my kitchen. After about a half hour of cleaning up the kitchen, it was time to go pick Avery up from school. I had my usual German lesson in the afternoon. We picked Bailey up from school and of course I made "taco bell" soft taco supremes for dinner. Friday, thank goodness it is Friday. I am still having glue issues. I've tried several different glues at this point and nothing is working which is making me nervous as I was relying on someone else to supply the glue for the kids craft on Saturday. Friday morning was nice. Bryn and I just hung out. Then, we had to take Avery a lunch to school because I had to stay and work with the fifth grade girls who had signed up to help me with the craft. However, when we got there, several of them said they wouldn't be able to help after all and we decided to just wait until Saturday and learn on the job. After school the girls and I went to the big grocery store because due to Bryn's sickness issues, we had gone through diapers lightning fast this week and I thought they might have glue as well. Turns out we were right. Getting everything you need in one stop in Germany...Priceless. We did dinner, spent some time together as a family, and when we put the girls to bed, I did a couple of the crafts to use as an example on the gingerbread man sign I made earlier in the week. Saturday morning was quick. Quick breakfast, last few touches on the sign, and Bailey and I were out the door. She insisted on coming with me for the set-up portion as well. We set up our stuff for about an hour before the Market started. Bailey and Olivia had a great time spending money on all kinds of stuff at the market, while I manned the Children's craft in the basement from 12:00 - 4:00pm. It was fun. We had several Christmas Cd's playing in our room which was nice and festive. Greg showed up at around 2:00pm and took the girls to see Santa. 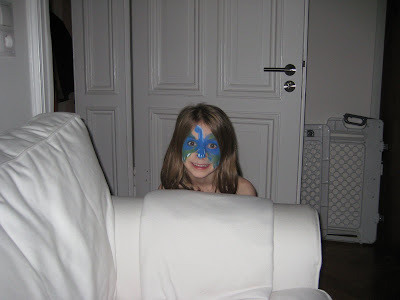 Unfortunately, we didn't have the camera with us but we took a picture of Bailey's painted face when we got home. They had good waffles with powdered sugar and cream which they brought me. Bailey also brought me some snacks and hot cocoa throughout the time. We were all pretty tired when we got home. But, we rested for a bit, and we were off again. 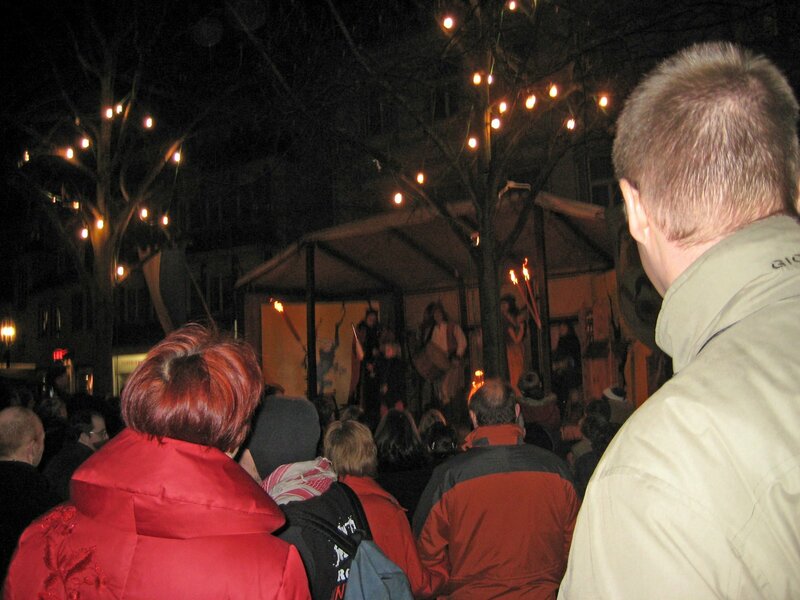 That evening we went to Siegburgs Christmas Market. 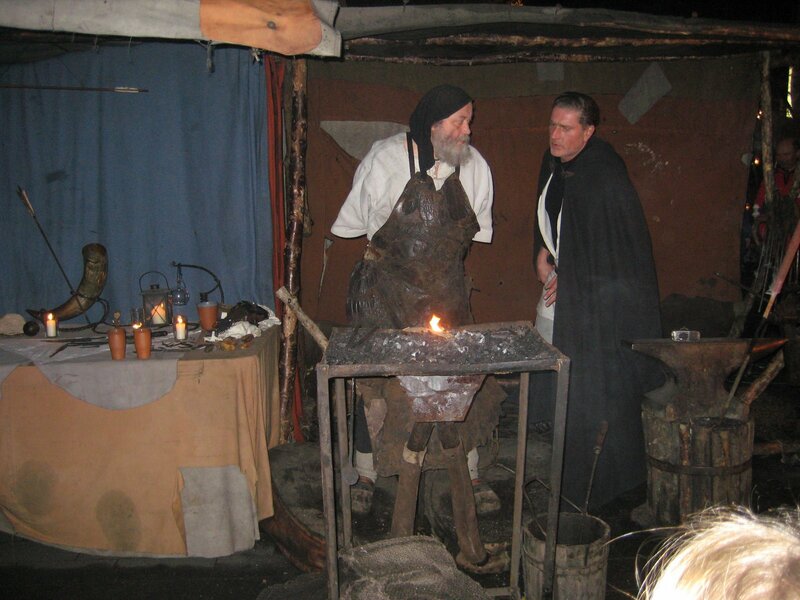 We heard it was really cool to go to in the dark, because it is one of the medieval markets, where they use candlelight to light the booths and their wares are handmade and from historic German markets. It was really cool. As "Wow" as I thought the Bonn Market was last week, this one was really amazing. We bought an oil lamp that is reminiscent of the ones I think the ten virgins may have used in the Bible. We bought some food of course which was different and really good warm brot (bread). We watched a blacksmith making something that we couldn't tell what it was, and there were several stages set up where Medieval entertainment was happening, musicians and jugglers mostly. Avery fell asleep in the stroller at the market so we figured we should probably get home. Sunday, we went to Church and what an amazing Ward we have. I have been letting myself get stressed already this Christmas season and after I heard the RS lesson today and the testimonies of our members, I really had to take a step back and realize that by allowing myself to get stressed about presents and children's crafts at Christmas markets, I'm denying myself the true feeling of Christmas. I felt the spirit so strongly today, and I realized that that is the feeling I want to have throughout the Christmas season, and ideally all the time. I wish for you to feel the Spirit as well. Also, as a side note for all of those that read this that can read German, I apologize for leaving out umlauts and the double s thing, it must be driving you crazy. It is not from a lack of knowing that they go there, it is just that I don't know how to insert them on the blog site. Sorry.